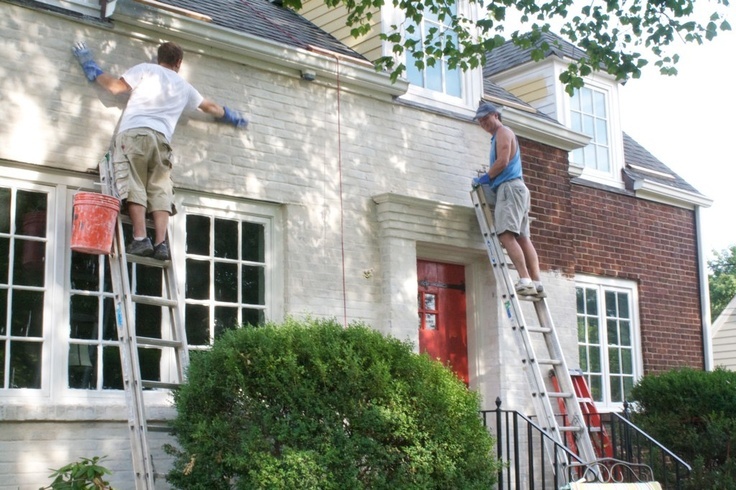 Paint can freshen a brick house but painted brick comes with its own problems. When brick is painted, the paint penetrates the surface, sealing it. Any residual moisture in the brick can eventually cause the paint to begin to blister and peel. In regions subject to freeze/thaw cycles, the trapped moisture can accelerate the deterioration of the brick and mortar as well as require the brick to be repainted periodically. Before painting, brick should be thoroughly cleaned to remove any dust, dirt or efflorescence from the surface that may prevent the paint from adhering. A stiff brush and soapy water may be sufficient. For tougher cleaning, try trisodium phosphate (TSP). Mix it according to directions on the label and wear gloves and eye protection. Do not use acidic cleaning solutions as they may affect the integrity of the paint. After cleaning, allow at least 24 hours for the brick to dry. With a large surface to clean, it may be tempting to resort to a pressure washer. Doing so will result in more moisture penetrating the bricks, so allow extra time for them to dry. Repair any damage or small cracks in the bricks or mortar with acrylic caulk. Allow the caulk to dry completely. More extensive damage to the mortar may require repointing. Once the brick is completely dry, apply a coat of latex primer. If you use a roller and brush, choose a roller cover with a ¾-inch nap and roll the paint on first, then follow up with the brush to catch drips and fill in the mortar lines. You can also use a paint sprayer if you are comfortable using one. For the paint itself, choose a high quality latex or mineral-based paint that is designated porous or vapor permeable. Apply the paint as you did for the primer. When natural brick feels too dark and heavy in a small room, paint can provide the solution. Clean the brick thoroughly. Use TSP for stubborn stains. Inspect the brick for cracks and damage; repair with acrylic caulk as needed. Apply a quality interior latex primer. For indoor applications, the use of a brush and ¾-inch lamb's wool roller is advisable. Start with the roller and touch up with the brush. Paint the brick, once again using a roller and brush, with a quality low-odor latex or acrylic interior paint. Professionals recommend a gloss or semi-gloss finish—it shows off the texture of the brick better and will be easier to clean than a flat finish. Brick stain can transform your brick without altering its character. If your brick surface is basically sound and your dissatisfaction is with its color, staining your brick may be an attractive alternative. Brick stain is available from a number of manufacturers and in a variety of tints. Unlike paint, brick stain is permanent and requires no special maintenance. The stain is actually absorbed into the brick like a dye and bonds chemically with the masonry. Staining does not trap moisture as paint does, so the brick retains its ability to breathe. And stain, being translucent, allows the variability of brick's character and texture to come through, resulting in a more natural appearance. With staining, the mortar between bricks is generally left untinted. This requires the stain to be applied brick by brick with a brush about the width of a brick's thickness. As you can imagine, staining is more tedious than painting, but your reward comes with its maintenance-free permanence. You can have brick stain professionally applied or you can do it yourself. Some brands of stain offer a set range of colors and some are presented as kits that allow you to adjust the color and degree of tint yourself. Investigate to determine the products available in your area.